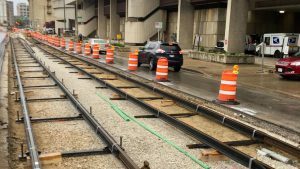 Milwaukee will shortly become the next U.S. city to power up a streetcar system. 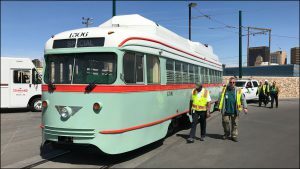 The first of five Liberty LRVs for Milwaukee’s The Hop Streetcar arrived in the city on March 26 after completing its road journey from Brookville Equipment Corp.’s plant in western Pennsylvania. The first LRV for the Oklahoma City Streetcar project arrived in the city on February 13 after completing its four-day, 1200-mile truck journey from Brookville, Pa.
Brookville Equipment Corp. has signed a $33-million contract with Valley Metro Rail of Phoenix to design, build and deliver six off-wire capable Liberty Streetcars for the Tempe Streetcar. 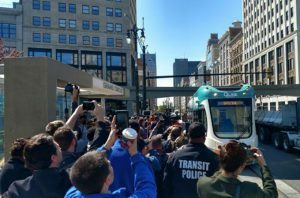 Streetcars returned to Woodward Avenue in Detroit for the first time in 61 years with the May 12 inauguration of the 3.3-mile Q Line from Larned Street to West Grand Boulevard. 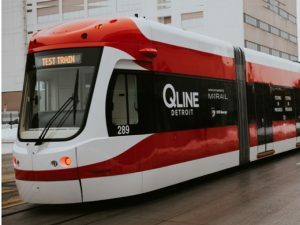 Brookville Equipment Corp. delivered its fifth and sixth off-wire-capable Liberty Streetcars to Detroit in March, wrapping up vehicle deliveries to the new QLINE streetcar line “ahead of contractual delivery dates and prior to the QLINE’s recently announced May 12 start of revenue service,” the company announced April 12. Brookville Equipment Corporation’s fourth off-wire capable Liberty Streetcar departed for Dallas six months ahead of contractual delivery during the week of July 25, concluding manufacturing on an order of two option vehicles initiated in July 2015, which followed a base order of two vehicles delivered during the Spring of 2015. 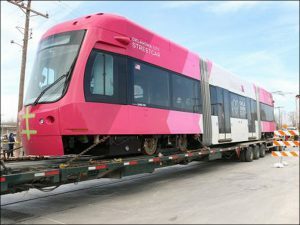 Brookville Equipment Corporation shipped its third of four American-manufactured Liberty Streetcars on order to the City of Dallas and Dallas Area Rapid Transit (DART) this week, marking the completion of the first of two vehicles ordered by DART in a contract option exercised in July of 2015. 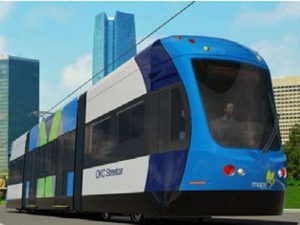 Oklahoma City on March 22, 2016 finalized a $24.9 million contract with Brookville Equipment Corp. for the supply of five Liberty Streetcars to support the city’s MAPS 3 Modern Streetcar program. 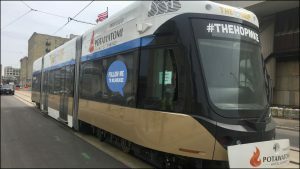 The American-made, electric streetcars will operate downtown along a 2-mile east-west loop and a 4.9-mile north-south loop.